Numerous surgical procedures can be life-threatening, tedious situations, many times in the most undersized of places. When a camera is required to assist physicians in these circumstances, the Toshiba IK-HD5H/IK-HD5E remote head camera system has imaging capabilities that are well-suited as a component of surgical microscopy. Switchable between 1080i (interlace) and 1080p (progressive) resolution, with 3CMOS HD sensors, 2.1MP, progressive, 1/2.9 inch image sensor, this IK-HD5H full high definition (HD) video camera is the camera when imaging applications require a small camera with increased sensitivity and outstanding performance. This camera provides the sharpest, clearest, true color imagery available – all from the most compact HD camera on the market. The latest in Toshiba’s 3-CMOS camera innovations, this progressive-scan, full-HD video camera features up to a striking 1,000 TV line resolution, a removable IR cut filter, image flip and mirror capabilities. With 3G-SDI/HD-SDI and DVI-D outputs 1920 x 1080p and removable optical low pass filter (OLPF) for dual-mode imaging applications, it has the ability to switch between visible light and near-infrared visualization. The Toshiba IK-HD5H camera produces optimal color accuracy, high resolution and increased sensitivity in an extremely compact size. 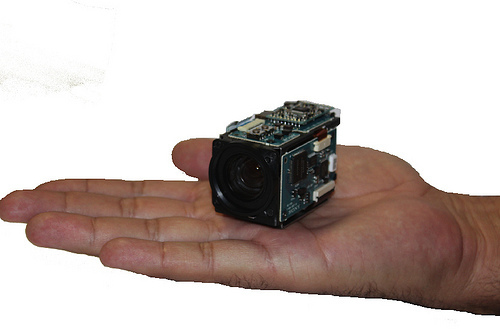 This diminutive camera head is only 1.28”x1.52”x1.61” (32.6mm x 38.6mm x 41mm) in size – fitting in the palm of your hand. With the Toshiba IK-HD5E 3G-SDI DVI camera control unit, utilizing 10.3 power consumption, and with 5-user configurable scene files, the two are connected with a camera cable up to 15m in length. Also small in size, the control unit measures 4.33” x 1.55”x7.32” (110mm x 40mm x 186mm), and weighs a mere 1.32 pounds (approximately 600g), and is the perfect accompaniment to this small camera’s arsenal. Toshiba High Definition Remote Head Camera System produces the finest in color exactness, small, compact package and provides unprecedented user-controlled features and advanced noise reduction technology. Toshiba’s advanced expertise in miniature 3CCD prism technology enables the Toshiba IK-HD5H/IK-HD5E camera to be the smallest, lightest 3CCD color camera systems available today, and one that provides the sharpest, most-clear and color accurate pictures available. This high definition, remote control camera system is of paramount importance when needed in surgical microscopy – ranging from delicate spinal and neurosurgery, to cataract and dental procedures, where dentists are able to record a wide variety of procedures, from restorative to endodontics to surgical.